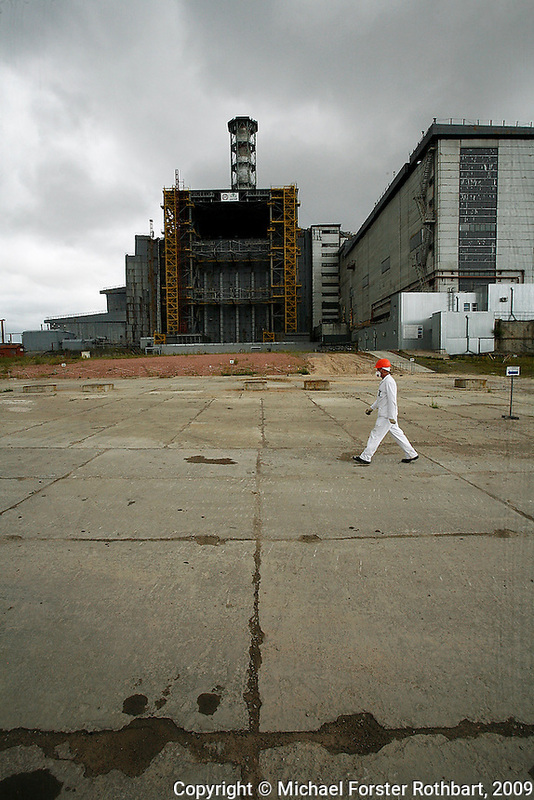 Chernobyl plant worker Sergei Koshelev crosses the high-radiation zone beside Chernobyl's ground zero. The concrete and lead Sarcophagus encloses the ruins of the reactor hall where the meltdown occurred. The Sarcophagus leaks and is structurally unstable. Construction workers preparing foundations for a replacement "New Safe Confinement" can hit their maximum daily dose in two to three hours. Original caption: .Sergei Koshelev, videographer for the Chernobyl SIP PMU (Shelter Implementation Plan Project Management Unit) visits the high-radiation zone just west of the Chernobyl Nuclear Power Plant's 4th Block Shelter (also called the Sarcophagus). Workers refer to the area inside the final high-security perimeter as the "local zone," where they are doing groundwork for construction of the New Safe Confinement super-structure that will replace the Sarcophagus..